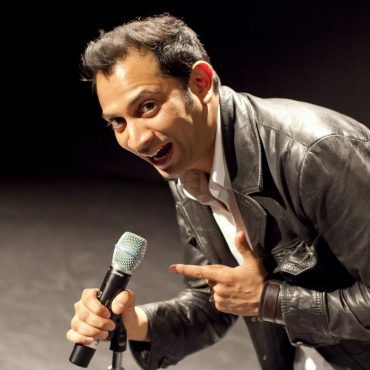 Anil Desai is a comedian/impressionist who performs an awe-inspiring , audience interactive show where he impersonates 52 famous faces in 5 minutes using names on a deck of cards. Like a celebrity filled, one-man 'Whose line is it anyway?' he performs a number of famous icons from Hollywood to Cartoon (incl. Nelson Mandela, Tom Cruise, Denzel Washington, Robert De Niro, Homer Simpson, and many many more) - From Al Pacino’s wide eye stare to Johnny Depp’s manic moves to suggestions from the audience in quick fire succession with hilarious results using his plethora of impressions and in the words of the Edinburgh Evening News following his 2010 show ‘Hey, Impressions Guy’...'It's not just clever but utterly hilarious... one to watch'. Anil was great! He really entertained the audience, ..they really liked his impressions .. he was a brilliant host!